A range of gear & piston motors are available from 16-200 cc/rev. Efficient and robust, the MBI series allows for an easy and safe change of rotation. A good performing, very low noise motor. 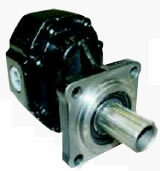 Gear motors with bi-directional rotation and the option of either rear or side inlet/outlet.